Your domestic cat has maintained their instincts of their wild ancestors. Cats’ claws are physically unique and serve several functions. The forelimb claws are retractable and allow her to expose or retract her nails as needed. A cat may expose their claws to hunt and use them to grasp and capture their prey. To defend itself during conflict with other cats or other animals. To mark territory, both visually (scratching inanimate objects) and chemically (via pheromones or scent). Why Do Cats Scratch Inanimate Objects? Scratching is a natural, normal, and necessary behavior for your cat. Your cat does not scratch to upset you or spitefully damage your furniture. Scratching is a form of communication and often your cat will scratch during times of stress and anxiety. To renew their nail by dislodging old nail growth and exposing a new, sharper nail underneath. To mark their territory visually and with scent (pheromones) as a message to other cats and animals. To stretch out their limbs. If your cat’s scratching or marking has increased, this may be a sign of stress or anxiety, including a threat or restriction to their environmental resources (food, water, litter box, safe place to sleep, familiar territory, etc.). It is important to figure out the cause of your cat’s stress or anxiety so you can address the issue and reduce the unwanted scratching behavior. A veterinary behaviorist may be needed to help resolve the problem. Living alongside a cat with claws can be an adjustment, especially if you are unfamiliar or a first time cat caregiver. Trim your cat’s nails regularly. Ask your veterinarian for a demonstration or discuss temporary synthetic nail caps as another option. Provide appropriate resources for each cat in your household. Provide appropriate environmental enrichment in your home to include interactive play, perches, and scratching posts that allow vertical accessibility, along with human attention if desired. Address any inter-cat related issues that may be causing your cat fear or anxiety. Inter-cat conflict is common and a cause of unwanted scratching behavior. However, since the signs are subtle, you may not know there is an inter-cat conflict problem in your home. Discuss this with your veterinarian. To help prevent conflict, make sure each cat has ample resources that are located in multiple locations throughout your home. This helps prevent competition for resources. There should be at least two ways where your cat can enter or leave each of their resources. This allows your cat to flee or escape if they feel threatened or stressed. Teach all members of your household to treat your cats with respect. No one should be allowed to play rough with you cat or handle her in a manner that causes fear, stress, or pain. Learn proper cat-friendly play techniques. What Makes an Ideal Scratching Surface? Each cat prefers different scratching surfaces. To determine which your cat prefers, offer an assortment of scratching options, in a wide variety of locations. Size and shape – Most cats like to scratch vertically. They will need a sturdy post that is taller than their body length to fully stretch and give a good scratch. If your cat is scratching your carpet, try a horizontal scratcher. Texture – The texture of the scratching post is also important. Many cats prefer sisal rope; others prefer corrugated cardboard, carpet, or wood on the scratching surface. It is important to experiment with a variety of textures and types of scratchers to determine which is preferred by each cat. 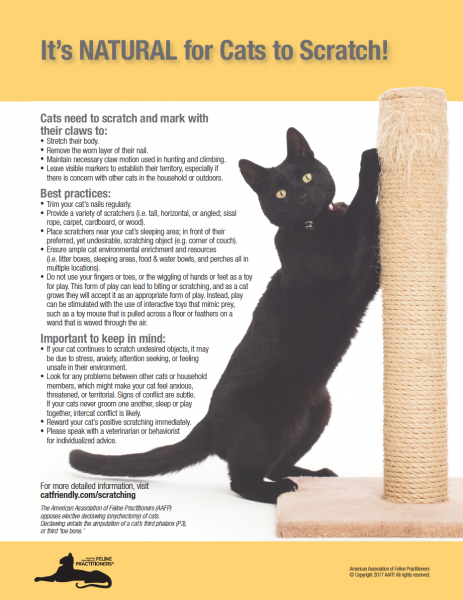 Is your cat scratching an unwanted surface? Is your cat’s scratching increasing in frequency? Your cat is scratching an unwanted surface. If the surface is near a window or door where your cat can see and/or smell another cat (or other smells), discourage or remove the unwanted cats from your yard. Or block the window view and use feline facial pheromones. If the surface is near where your cat sleeps, place a scratcher near her sleeping area. Place a scratching post or pad near where your cat is currently scratching that is unwanted (e.g. in front of a couch leg, or door to the outside). If your cat scratches somewhere other than the scratching post or pad, gently pick her up, take her to the scratcher, and then provide a reward within 3 seconds (i.e. treat, grooming, play, or petting). Schedule an appointment with your veterinarian so you can discuss all aspects of your cat’s health, environment, interactions, daily schedules, scratching behaviors, and locations, to identify possible causes and solutions. Some cat caregivers have found success with the placement of two-sided sticky tape, tinfoil, plastic, or furniture covers as a first step to reduce scratching on surfaces. Cats that like to chew plastic should not have access to that type of surface cover. Remember to place a scratching pad or post near this area to give your cat an alternate surface to scratch. Your cat’s scratching is increasing. You will need to figure out and address what may be causing your cat’s stress, anxiety, or frustration. Speak with your veterinarian to discuss possible reasons and solutions. Yes, you can train your cat to scratch certain, approved items and train them not to scratch others. Cats often stretch or scratch when they wake up, so place a scratcher near her sleeping area. Place a scratching post or pad near where your cat is currently scratching that is unwanted (e.g. in front of a couch leg, or door to the outside). The changes in scent can result in your cat re-marking that area. If your cat scratches somewhere other than the scratching post or pad, gently pick her up, take her to the scratcher, and then provide a reward. Provide rewards and positive reinforcement. As you redirect your cat to use the new scratching post or pad, reward her immediately (within 3 seconds) to reinforce this positive behavior. Find a reward your cat really likes (i.e. treats, catnip, interactive play and petting, or grooming). Introduce interactive play early in your cat’s life so she can learn how to play with you. Never use your fingers or toes, or the wiggling of hands or feet as toys during play. Although it may seem cute with kittens, as your kitten grows into a cat, she will believe this is an appropriate form of play. Scratching or biting can lead to painful injuries and infections.